'Grinding' is used to describe a specific manoeuvre in Armagetron Advanced, and is usually the only way to make your cycle accelerate in-game. Due to this, grinding is one of the most important basic tactics to learn if you are going to gain any advantage over your opponents. Grinding is the act of driving your light cycle in a parallel direction close to a wall, in order to gain from the wall acceleration effect. The closer your cycle is to the wall you are grinding, the faster you will accelerate. If your cycle is close enough to the wall you're grinding that it 'rubs' against the wall, sparks and a sound effect will accompany the grind. The concept of driving a light cycle close to a wall to gain speed can be seen in Tron  the movie released in 1982, and has been an integral part of Armagetron since it's inception. The term 'grinding' however seems to have come about through popular use, but is as much a part of common terminology now as the grid itself. Grinding tends to be easier in an online game, where rubber aids in driving as close as possible to a wall. In a local game configured for very low rubber though (in the absence of network latency), grinding is a much more difficult skill to master. Red travels in a straight line in one direction, and blue drives their cycle at right-angles towards red's cycle wall. At the very last moment, blue turns in the same direction as red, leaving as small a gap as possible between himself and red's wall. 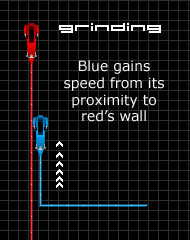 Blue now benefits from the acceleration effect of 'grinding' against red's wall, and will eventually overtake the red player if they continue in parallel. Although the acceleration gained from grinding is undoubtedly very beneficial in a game where your only weapon is the trail left behind you, it does decrease the amount of time that you have to react to certain situations. In the example given above, if the red player suddenly turned to the right and 'boxed in' the blue player, blue would have far less time to both see the turn and to react to it in time to avoid driving into the resulting perpendicular wall. For this reason, grinding an opponents wall and trying to overtake them is tantamount to in-game suicide. The effect of wall-acceleration can be amplified by grinding between two walls. This is sometimes called a slingshot and players can often end up gaining a huge speed boost using this method, allowing them to quickly box in other players. Some maps may have acceleration enabled on the grid walls too, allowing players to grind the outer wall of the grid to gain speed. This speed boost can also be compounded by grinding 'outside' a cycle wall, up against the grid wall. It is only possible to gain speed from the closest wall to your cycle, another parallel wall to the one you are grinding on the other side of the wall to your cycle, will not bestow any extra speed. This does have an interesting effect in servers that have a large factor of outer wall acceleration set, and you should be wary. If a wall that you're grinding that is is close to the rim wall suddenly disappears, you'll experience a huge and unexpected increase in speed from the rim wall. Not only is grinding an essential skill when attempting to best an individual opponent, but it must also be employed in a team game, where a faster team can easily overrun a slower one. In a team game, you should always attempt to grind at the start of a round to give your team the benefit of speed. Further information on this and other tactics can be found on the Teamplay page. As grinding against a wall often requires very precise timing, rubber can play a big part in getting closer to a wall. Rubber effectively allows you to drive your cycle 'deeper' into the wall (See digging), and gain a better grind. Depending on server settings, this effect is often used over and over by players to create a slingshot for themselves by repeatedly turning 180 degrees against a wall and grinding deeper and deeper against it. In earlier versions of the game, this could sometimes lead to a player 'breaking out' of the playing arena into the limbo beyond, however this bug has been fixed since version 0.2.7.0 of the client. This page was last edited on 19 July 2007, at 15:52.